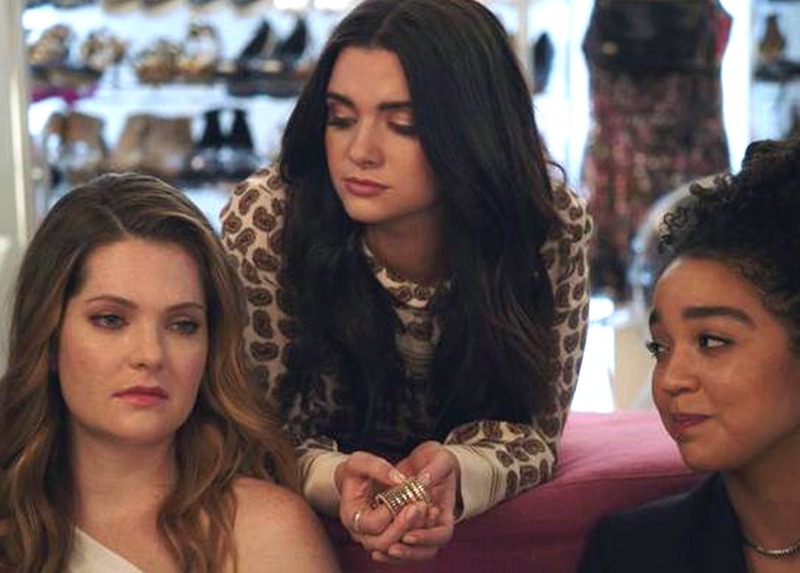 If you have never seen it, the show, based on career commentary of former Cosmopolitan editor-in-chief Joanna Coles, centers around three friends in New York City who start out working at a fashion magazine, Scarlet, in different capacities. It touches on issues such as race, religion, immigration, privilege, feminism, female empowerment, politics, and of course fashion and beauty. All the things. In my opinion, The Bold Type does so in just the right doses. The show’s magic is being able to draw viewers in with thought-provoking topics; keeping viewers engaged without being too preachy, and leave them wanting more. Watching a second season of single girls, albeit fictional, create and innovate was the tipping point I needed to take myself and my blog more seriously. Here’s what I mean. 1. The headline is just a part of the story. One of my favorite episodes from season two was entitled “Betsy.” Betsy was the name of Sutton’s gun, and Jane, her roommate, had just found it in their apartment. I watch an enormous amount of television and this was not a topic I had seen approached by a group of girlfriends. Conceivably, there were only two outcomes to the gun in the home, but I found myself extremely curious about what the show’s commentary would be on the matter. Jane, the young writer trying to make it in publishing as a “real reporter,” was able to turn the issue into a story. From this, I realized that anyone can write down all the things they did or ate or spent today, but the craft is in asking yourself: how can I share this point of view in a way that relates to others. When I was exploring catchy titles in my summer challenge, I thought at first the secret to creating shareable content was rearranging titles to make them attention-grabbing. That is part of it but it is not the sum of it. No, the goal is sharing your story in a way that relates to others and their story — therein lies community. In the episode “Betsy,” writer Jane was strongly opposed to having a gun in the home she shared with Sutton. However, instead of an op-ed piece on gun control laws, the story became “I love everything about my BFF except her gun.” That title draws a reader’s attention because laws are as complicated as relationships. People live in between the layers. That’s where the story is. That’s where the connection is. So now you’ve grabbed the reader’s attention; engaged them; and left them wanting more. The girls work at a fashion magazine. They live, eat, sleep, breathe fashion and popular culture. That is their brand. You cannot be taken seriously in their industry if you don’t look the part. Outside of this fictional world, I am reminded of a time when I was on clinical rotations acquiring my massive student loan debt. One of the medical residents was bemoaning her single status (how dare she! ), but to look at her you wouldn’t tell she was on the market, so to speak. Inside the hospital, she looked like a medical resident trying to get through her residency. She wore scrubs and carried a pager, a stethoscope and a well-worn copy of MDPocket, so we knew she wasn’t the janitor. But nothing about her uniform told any interested parties she was single and seeking. Outside of the hospital, she had cut-hair (different from a styled haircut), wore no make-up, and often times stayed in the scrubs. She looked efficient and industrious, not single and looking. There’s a uniform for that and she was not wearing it. The uniform matters. It tells people who we are and what we’re about. In the case of my blog, there’s a uniform for that as well. If I wanted to be taken seriously as a blogger, I couldn’t remain on Blogger. I created 100 blogs posts from my mind, and I needed the world to know that I was here and I had something to say. Moving to WordPress and self-hosting was my way of doing that. If I don’t take myself seriously as a blogger, who will? Even if I never receive any recognition, it won’t be because I didn’t believe I was a worthy contender. The parts of each episode of The Bold Type where I am most captivated are when the characters are using their creative energies to complete a task, solve a problem, or overcome an obstacle. In Season 2, Episode 4, I was right there with Jane as she tried different writing styles after losing her job for standing up for her beliefs, and eventually earned recognition for piece that was difficult to write. I was a part of the conversation in Season 1, Episode 3 when Kat used her social media influence to give a voice to gender inequality. Sutton’s journey throughout Season 1 with the issues women face in the workplace was a part of my journey, and her ability to succeed and surpass even her own expectations for the underfunded shoot in Season 2, Episode 8 to make it to Paris in Season 2, Episode 10 was the picture of a woman coming into her flow. That intersection of skill and challenge is where we as humans optimize our flow. Working on my blog has been that for me. It has become both my creative outlet and my source of flow. The female brain responds to stress by nurturing, organizing, and grooming things. It’s why people start families, seek relationships, and even religion — for what is religion if not a relationship with God and other believers. It’s not why I started blogging, but it’s why I started to take blogging more seriously. Even without remarkable page views or income, I can’t stop thinking about ways to make my blog better. It keeps me from plateauing. Every time I see a post to completion, my mood is elevated. I call it my creator’s high. To know that one day I could potentially reach another single girl like me trying to find her place in this space moves me forward towards that next challenge and that next level of skill to be mastered. Much like Jane who uses much of her personal life as writing prompts for her stories, I find inspiration everywhere. Much of it stems from my personal life and my past. It used to be my life, my history, my thoughts, my dreams, things unsaid. It has since evolved to include inspiration from other bloggers, my co-workers, the nasty man behind a customer service desk — I have yet to run out of things to say. As long as I keep breathing, I have found there’s always a way to connect to a reader. 5. I’m good at this. In the last episode of season two, after pulling off the Paris shoot amidst a few obstacles, Sutton recognizes the truth of her talent and simply utters, “I’m good at this.” She’s good at what she does and the realization makes her smile. It’s as though I needed somebody else to say it first. Blogging helped me realize I am a writer. It’s something I’ve always enjoyed doing and hoped was true, but could never say aloud. Who decides if or when you are a writer, I wondered. Is it after you’ve been published? Is it where you’ve been published? Is it when? Or is it after you’ve made money with your writing. Who decides? You. Just you. I am a writer. For now, my medium is this blog, but I am a writer. One of my creative writing teachers once said you know you’re a writer if you always carry a notebook. That’s always been true for me. I am writing notes for my blog everywhere. Everywhere. I write notes at work, full drafts on my break, scratch notes while driving, notes at my bedside, my side table, my purse, my laptop, my iPad, my planner, receipts . . . I woke up the morning of Sep 5, 2018, after publicly announcing my sabbatical, and my first thought was, “This is what I am meant to be doing.” Maybe I was caught up in the moment of the start of something new, or an upcoming week off from work, or maybe it’s true. Affirmations and self-realization are a central theme to a life lived more boldly. So, I say to you, dear reader, recognize your truth and live in it, splash around a bit. A single 30-something actively trying to leave the workforce on her own terms and figure out what exactly to do with her life. Blogging about being the last remaining single 30-something’s journey to early retirement at My Early Retirement Journey.